FilterBank3 is more than a filter plugin - it is a complete plug-in Synthesizer and a flexible Multi-effect Unit. The modular design and flexible modulation routing give you nearly unlimited possibilities. 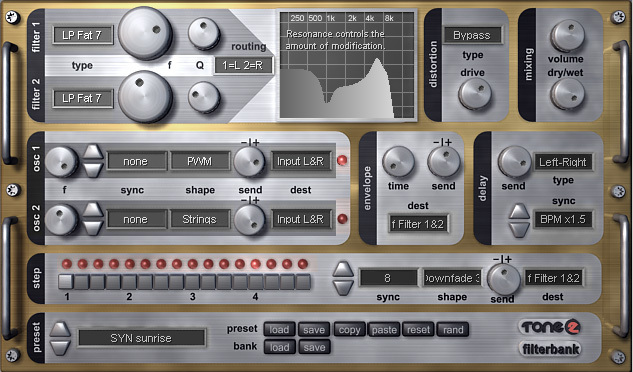 With self-oscillating filters, oscillators and feedback it can create complete sequences and textures. The built-in step sequencer can create rhythmic sequences with some mouse clicks. 2 anti-aliased OSCs/LFOs with BPM Sync and 11 wave shapes. Alias free FM and AM. 12 oversampled types of distortion. 20 types of surround delay, reverb. Can be loaded as synthesizer as well as effect. Vocal filtering, equalizing, phasing, flanging, compression. Tool tips and help functions. Fixed hanging notes is Sonar and other hosts. Improved sound: Less aggressive treble. Dry/wet knob did not work in FX version. Load/save window does not longer vanish after moving it.